A creeping or sprawling* perennial, up to 10 cm high. Stems woody at base. Leaves broadly ovate to suborbicular 2-7 mm long and 2-7 mm wide, puberulous* with prominent nervation. Inflorescence a short, rather congested verticillaster*, consisting of approximate, 1-3 flowered, rather congested, axillary cymes. Bracts similar to leaves but often with more strongly defined nervation. Bracteoles very small, subulate*. Calyx-tube 5-6 mm long, about 2 mm wide. The abaxial* calyx-teeth longer and more slender than the adaxial*. Corolla pink or purple, bilabiate, corolla-tube narrowly infundibuliform*, 9-10 mm long, 3 mm wide at apex. Nutlets oblong, about 1,5 mm long, o,8 mm wide. 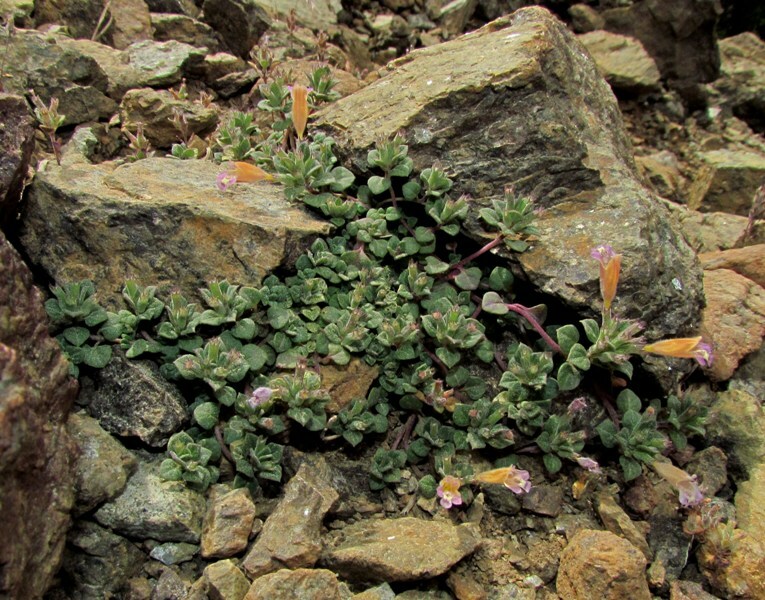 Habitat:Rocky slopes and screes at high elevations on serpentine. 1. Included in the �Red Data Book of the Flora of Cyprus� where it is categorised as vulnerable (VU), according to the IUCN red list criteria. 2. The estimated number of individuals is about 1500, though there is a chance of more subpopulations to be found. Main threats of its population are reforestation works and recreational activities, such as trampling by hikers and extension of ski facilities. *Sprawling= to spread out, extend, or be distributed in a straggling or irregular manner. *Verticillaster= an inflorescence in which the flowers are arranged in a seeming whorl, consisting in fact of a pair of opposite axillary, usually sessile, cymes. *Subulate= slender, somewhat cylindrical, and tapering to a point; awlshaped. * Abaxial= being or situated away from the axis: the abaxial surface of a leaf. * Adaxial= situated on the side toward the axis or stem. Καλή παρουσίαση αυτού του όμορφου ενδημικού και του οικότοπου του. Η σύνθεση είναι εξαιρετική.